Evelyn Smith knits a hat each day for premature babies. ROELAND PARK — One tiny hat each day — that’s what Evelyn Smith crocheted for premature babies this past year. A parishioner of St. Agnes Parish in Roeland Park, she has spent a lifetime doing for others. She started young. Smith was born in Brooklyn, New York. She married a Navy man and moved to Wisconsin, where she served as secretary to the general at Fort McCoy. The family then settled in Kansas and joined St. Agnes Parish. Smith served as president of the Single Mothers Club and as secretary of the parish school for 30 years. She sent her children to St. Agnes School and to Bishop Miege High School. During those years, she made and gave away hats, scarves, socks and sweaters. “I knitted red socks for my husband who was a Chiefs fan, argyle socks for my daughter and hats for the Salvation Army,” Smith said. Her biggest challenge was a Barbie doll wedding dress crocheted out of very fine string. Smith also spent many hours helping and listening to children in the school office. Many of the ones that had gotten in trouble in school came back over the years to see her. “They said I was the only one that understood them,” she said. After her retirement in 1997, Smith continued to live in her Westwood home and do for others. A year ago, she moved to Bishop Spencer Place in Kansas City, Missouri, where she participated in the Thursday Needlework Hour with other residents and employees. “People always come by to see what Evelyn is making,” said Stephanie Harriman, activities assistant. With her family scattered around the country and herself living in a new place, Smith knew she needed to seek fulfillment. She knew it would be found in doing for others. That was when the idea for hats came to her. Chaplain Kathy Hall recently delivered 50 hats to Children’s Mercy Hospital. “It was quite a prodigious collection,” she said. Smith crocheted one little hat each day. At age 91 and with limited eyesight, it wasn’t always easy for her. “If it became a chore, I put it down and came back to it later,” said Smith. 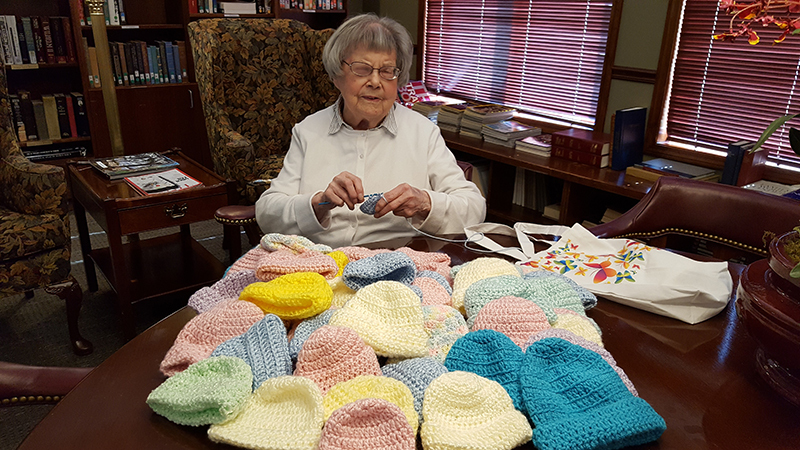 She also crocheted lots of small hearts for the staff and friends at Bishop Spencer Place. But she always maintained her connections with St. Agnes Parish. Father William Porter, pastor of St. Agnes, even came to see Smith — because his two nieces were having babies. Luckily, she had some blue and pink yarn. “I just start at the top and go round and round until they are long enough,” said Smith. And then she adds the finishing touch. “I always say a little prayer for the baby that will receive the hat,” she said. Meanwhile, Bishop Spencer Place’s chaplain has only this to say about the dedication of the 91-year-old resident. “We take off our hats to you, Evelyn,” said Hall.